Our landfall was memorable. 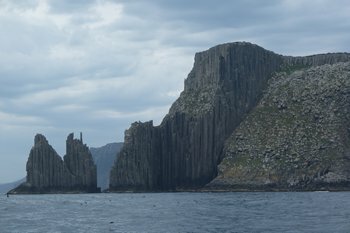 Incredible stacks, basalt organ pipes on a grand scale and very dramatic. We left Duet in Hobart for a week whilst we heading off up to Cradle Mountain. A high mountain land of wild scenery not dissimilar to New Zealand and home to the last of the remaining Tasmanian Devils. The Devils are on the highly endangered species list. 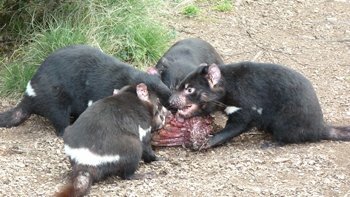 This is because the so far incurable TDFT or Tasmanian devil facial tumour cancer is infectious and kills them in the wild. Researchers think that the problem maybe genetic due to interbreeding. There was never a huge population in the first place and when white man arrived in Tasmania they succeeded in killing a large number of these extraordinary mammals. The research team at Cradle Mountain team are working on a selective breeding program to see if they can eliminate this cancer. It looks like an uphill battle, the gene pool is very small but there are pockets of wild Devils in Western Tasmania that they hope will be their salvation. They are extraordinary looking creatures – sort of a jaw on legs with a mouthful of teeth. They can open their jaws to a 90 degree angle, the intent is to scare off the opposition, that along with it’s extraordinary sound it makes, a cross between a pig being slaughtered and a screaming dog. No wonder the new settlers were scared to death and then of course killed them. They were also used as a threat to the convicts that the devils would find and eat them if they tried to escape… Actually I thought they were rather cute looking especially the ‘imp’ we were allowed to pet after the introductory talk before visiting the enclosure. We had great fun with Tim and Ginny, good sailing, excellent weather and a lot of laughs. Tim had brought his fishing gear but fishing is not as good as in New Zealand. Port Arthur is a place that we knew we had to visit. This is the site of the once notorious penitentiary. Lady Franklyn described her first impression of it in letters home in 1888 as being …’quite like an English country village with neatly kept gardens and pleasant lawns and not in the least like a prison.’ The goal had once been a flourmill that had been abandoned. Situated at the far end of the Tasmanian peninsula it was ideally situated for solitary confinement. The soft sandstone bricks looking warm and mellow in the sun belied its grim purpose. Our plans, like all cruising plans have changed suddenly as I have to return to New Zealand and the dentist – no don’t ask. Goodbye to Port Davey, Hello to Stuart Island!